“New year, new you” applies to fitness and personal goals. So why not employ the same logic to your company’s website? Your website is the first interaction anyone has with your company. It’s worth continuing to optimize and update, and with 2019 on the horizon, now is an excellent time to consider a website design. But with website design and user experiences continually changing, it may be difficult to know where to start. Not only is the look and feel important – you want it to be inbound-friendly to maximize the revenue it generates. Continue reading for some important tips, trends, and examples of good website designs to spark inspiration for your project in 2019. If you want to redesign your website, you and your company can take two paths: outsourcing or designing it yourself. You know your brand best, and communicating ideas can cause headaches occasionally. However, a website design is a massive undertaking and may overwhelm your in-house team. Using an agency and firm has its benefits and challenges, as well. An experienced agency is skilled in making user-friendly, branded websites. They’ll guide you through the process to create a seamless experience. They also ensure it works and keeps up with trends! What Elements Must You Have? Many website components are fundamental and do not change over time. 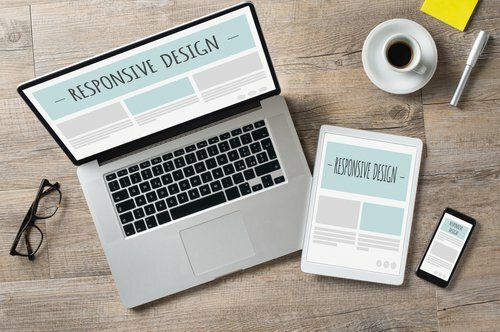 For 2019 and beyond, that maintaining a good user experience is crucial, including a responsive design, so your website conforms to every and any device your visitors may be using. Some companies’ websites offer a great desktop version but lag on mobile, or vice versa. Your website should also be easy to navigate and easy to scroll on both desktop and mobile. You must address your target audience or personas’ pain points within the content of your website. Place easy-to-use contact forms strategically throughout your site. The style and syntax of your copy should be consistent as visitors jump from page to page. Your design features should work in your favor and never distract from the core message of your website. What Trends Are Emerging for 2019? Modular, non-standard designs. These designs directly oppose tradition. They’re modern, clean, and uncluttered. Based on a grid, these designs are highly responsive. If your website traffic varies massively between desktop and mobile, this is a good choice. It’s important to keep the bulk on your essential information on the left, leaving the remaining portions minimal. Full-screen videos. More companies are using full-sized videos to portray their messages. Consumers process the information in videos 60,000 times faster than standard text. If you have a complicated message to rely in a short amount of time, a video is a great option. Hero images. Already a familiar trend, these large background images will be sticking around in 2019. Prominently placed on your homepage, a hero image is the impactful first visual someone encounters when visiting your website. Choose this photo wisely. This powerful photo should present an overview of your company in a glance. Minimalistic designs. Stripping your website down to its simple colors, shapes, and content can be compelling. They simplify the web interface and user interactions with your site, driving home what you consider is the most vital components of your company. Mixed, large, and unique typography. Some businesses recently began using different approaches to the fonts on their websites – and it appears it will carry into the new year. More designs use a mix of horizontal and vertical texts. There’s more color than the standard one or two. Companies utilize a variational font to break up elements on webpages, as well. Geometric shapes and translucent buttons. Websites tend to be flat. Interesting shapes and patterns set you apart. Translucent, or ghost, buttons add a differentiating element to sites, encouraging users to click on it. Unique shapes also help with this type of engagement. Cinemagraphs. A cinemagraph is a high-quality video that runs on a smooth loop. A new, popular way to add movement, cinemagraphs spark interest that can help reduce the bounce rate on your pages. They work best on minimally-designed websites. Responsive and sticky navigation bars. Many websites reduce their navigation bars on their mobile versions. With a responsive menu bar, such as a drop-down menu that toggles icon for link drops-down, visitors have access to your entire site no matter what. Sticky navigation follows users as they browse your site, making it easier for them to navigate to other portions. Some navigation bars collapse into more manageable versions with fewer options as users browse, but remain sticky. All these methods promote time on site, on various devices. If you want to see some of the above elements in action, visit the following companies’ sites. FiftyThree. FifthyThree creates digital tools for human creativity. The site uses a minimal, non-standard design with a full-size hero image. FiftyThree uses bold typography on other pages of the site. Gusto. Gusto provides payroll solutions to small businesses. Their site’s navigation is sticky but expands to show a free trial button as users scroll. The homepage design is bold yet minimalistic. They mix font sizes and serifs throughout the interior pages – and have unique graphics and shapes throughout the entire site. Asana. This project management tool company uses a large cinemagraph on the homepage, bright colors with interesting shapes and graphics, and a sticky navigation to showcase their product. Grain and Mortar. Another design studio, Grain and Mortar, features a full-sized video on the homepage of their site. They also use hero images on the homepage, and translucent overlay buttons on internal pages. Yapstone. Yapstone helps companies integrate payment into their businesses. Their homepage has a full-size cinemagraph, mixed fonts, bold colors, and a sticky navigation bar. Your website is what consumers will judge you on. It’s often the first place they learn about your company. You should treat your site as an extension of your sales and marketing teams. The design should be effective, both in style and usability. Think of it as a living, breathing thing that needs to be tended to regularly. Redesigning your website in 2019, especially if you haven’t touched it in some time, is a great idea. Biz Tips: What Is Mobile First Design? Biz Tips: Is Your Time Management Working for Your Personal Brand?